A golf certificate officially recognizes the great achievement of a golf player in a tournament or championship. The tournament trophy is never complete without the certificate templates and it’s something which is greatly cherished by the players. All golf championships honor the champions and runner-ups with a golf certificate. Do you too have to design golf certificate for your upcoming golf tournament and are looking for expert guidance? Well, there are readymade golf certificate templates online to help you. 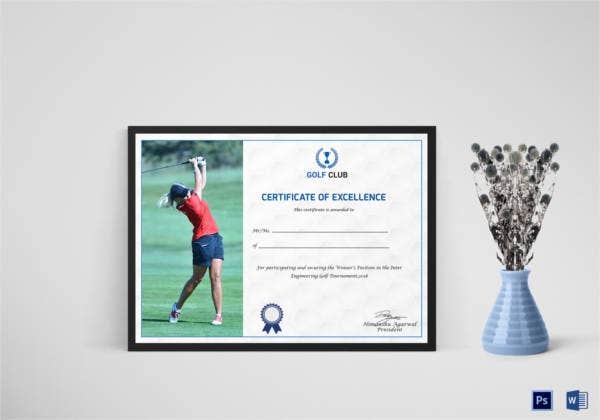 The template is a sure-shot winner when it comes to best golf certificate templates, courtesy the golf ball elegantly positioned right at the top of the template. It’s very smartly layered and soothing to the eye. 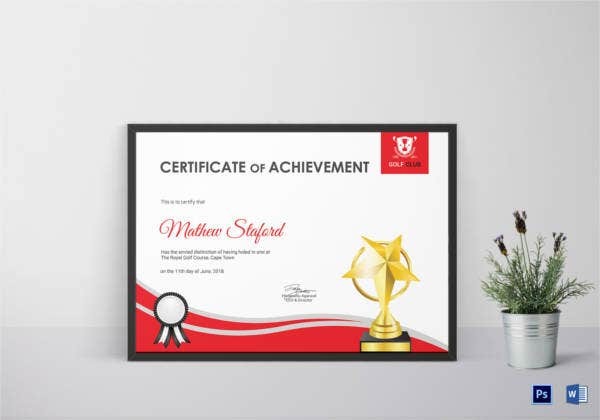 The dash of red against a muted off-white background renders a bright appeal to the overall structure, complementing the glorious aura of a winner’s certificate- not to forget the imperial trophy shining below. 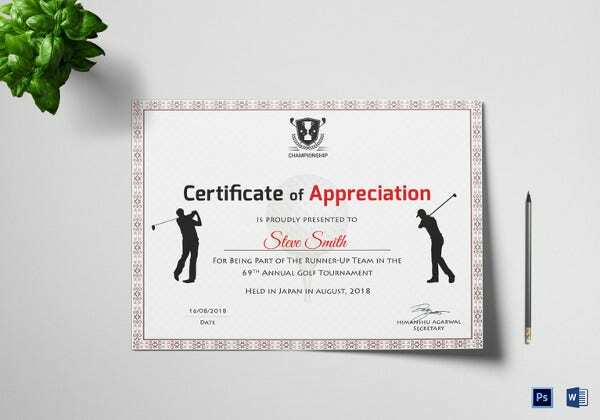 This golf certificate template follows an elegant layout where you have the left side left completely for the logo and name of your golf club while the right side is meant for the certificate content. 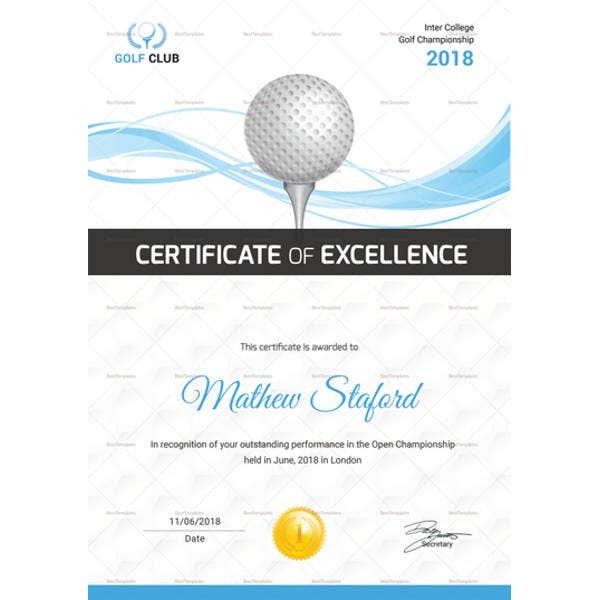 If you are looking for a golf certificate template that will enable you to include the picture of the championship winner on one side, this template here would be the right thing for you. With the two golfers teeing off in glory at two sides, this has to be the perfect golf certificate template for any golf tournament running organization. It’s neat, smart and very professional. > Who would need a Golf Certificate Template? Golf certificates are meant to reward the winners of golf tournaments. Thus, a golf certificate template would be much needed by all the organizations that arrange the golf championships, including the golf clubs. It is customary to acknowledge the golf champion with a written declaration and hence the certificate templates would be a handy help here. Whether it’s a college based golf tournament or some elite international golf event featuring the world’s bests, a golf certificate is required in any championship of the sport. The golf certificates are not only awarded to the winners of the tournament but are also given to the runner-ups and other participants. > What is the Purpose of a Golf Certificate Template? The main purpose of the golf certificate template is to officially honor the winner of a golf tournament. 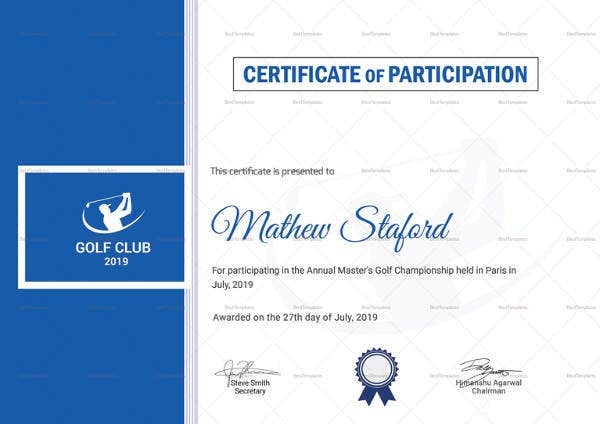 The free certificate serves as a proof of great merit of the player and will act as a formal evidence of his/her caliber in golf, wherever required. Besides, as the golf certificates openly acknowledge the great caliber of the player, they work to inspire a grand sense of confidence in the player, encouraging him to play hard and come up with many such amazing feats. It’s really tiring to design the certificates in your packed schedule. But don’t worry, the pre-designed golf certificate templates would make your work easier. You can also see Boxing Certificates. All the golf certificate templates mentioned above would be handy when you are planning to prepare golf certificates in your tight schedule. Each of them is designed by professionals and offers you a standard smart elegant structure necessary for the best golf certificates. You can even include the picture of the champion in the template.